Click on any name to go directly to that artist’s bio. Steve loves making fun stuff from found metal objects and shows at the High Hand Gallery and Flower Farm Nursery. 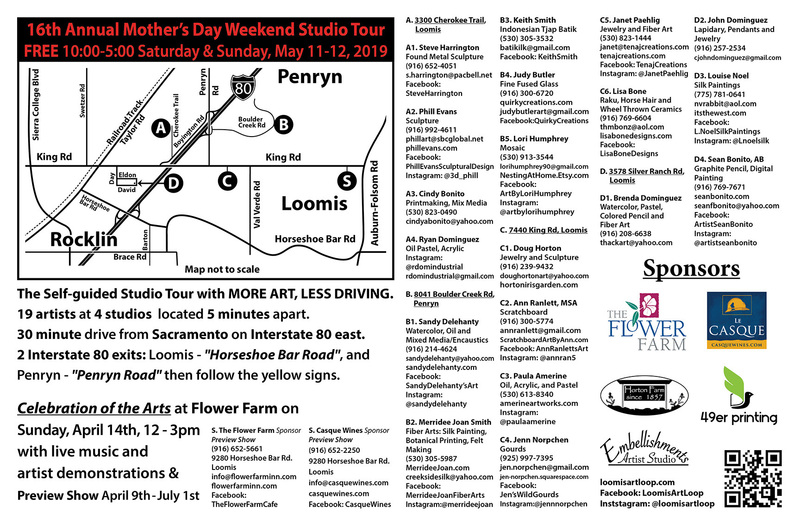 Sculptural designer Phill Evans has been producing sculptural arts and design in the Sacramento area, regionally and nationally, for the past 40 years. Inspired by people, places and things, Phill’s creative curiosity is charged by personalities, historical perspective, geophysical observations and balancing design conclusions with the engineering sciences. Working with metal glass, stone and wood, Phill has created many award wining sculptural concepts in kinetics, furniture, figurative works and public art. Visit his web site to see examples of the many techniques and skills, producing classical and contemporary designs for individuals and the general public to enjoy. Cindy Bonito is a local artist who has lived in the foothills for the past 12 years. She works in several mediums including relief printmaking, photography, and painting (watercolor & soft pastels). Her training in printmaking came from course work at both Diablo Valley and Sierra Colleges. Cindy has participated in numerous local art events and tours. Redwood City. His painting “Man a War” appeared in Emboss Magazine in January 2017. Ryan has also completed two murals one of which is located in downtown Loomis at Phoenix Cycle Systems. Ryan teamed up with Brenda Dominguez to complete the mural in the summer of 2017. That same summer, Ryan completed the second mural on the ceiling of the patio at Sac City Brews Neighborhood Tap House in Sacramento. Sandy Delehanty’s award winning paintings are in public, corporate and private collections in the United States, France and South Africa. Sandy has been exhibiting in galleries since 1993 and has had 25 solo shows, six two person and many more group gallery shows. Her paintings have been juried into both national and international competitions including the prestigious American Watercolor Society International Juried Exhibitions in New York City, 2018 and 2019. Sandy’s paintings have also been juried into exhibitions in art museums including the American Women Artists Juried Exhibition at the Haggin Museum and the Yosemite Renaissance 33 Exhibition at the Yosemite Museum Gallery both in 2018. This summer she will have a watercolor in the American Women Artists Juried Exhibition at the Steamboat Springs Art Museum. She has earned Signature Status with the American Women Artists and the California Watercolor Association. She is represented by Sparrow Gallery in Sacramento, Auburn Old TownGallery in Auburn, and Art Obsessions Gallery, in Truckee, California. Animals, nature, color, and whimsy are just a few of the themes that influence Judy’s fused glass. She is fortunate to live on a farm in Newcastle, surrounded by numerous animals, loving family and natural beauty. Her glass studio is located in this inspirational setting. Her process starts with creating a design and then carefully cutting pieces of glass. It’s layered in a kiln where it is fired for approximately 18 hours. This may be repeated several times until the artwork has achieved the desired effect. The pieces Judy creates are one-of-a-kind and include fine jewelry and pieces for the home. Her unique products demonstrates craftsmanship and design with a touch of whimsy. Judy’s work is displayed at several local galleries, stores and on the internet. Keith became enthralled with the use of wax and the Indonesian batik copper printing blocks known as “tjaps” at the World Batik Conference held at the Massachusetts College of Art in 2005. There he met Indonesian batik artists Agus Ismoyo and Nia Fliam from whom he subsequently took a tjap batik class and, in 2014, spent a month honing his technique in their studio in Yogyakarta, Indonesia. Keith says, “The cauldron of wax reminds me of the foul smelling concoctions I used to cook up in my past life as an organic chemist. Since then I have avidly collected tjaps, had some custom made in Indonesia, and have gradually improved my skills in the use of wax, tjaps and dye to create bold, colorful designs.” Keith uses the traditional techniques and tools of Indonesian Batik to create contemporary and abstract effects with this old technique. Keith has studied design with Susan Louise Moyer and collaborates with his wife, fiber artist Merridee Smith, on works combining tjap batik and silk painting. His work may be seen at the Auburn Old Town Gallery. Merridee is enthralled with fiber and plants, and these combined interests have resulted in her love of fiber arts: silk painting, botanical printing and felt making. As a silk painter, her particular passion is subjects from nature, particularly flowers. She was honored to be recognized by her peers in Silk Painters International as a Master Silk Painter, and her work may be seen in Susan Louise Moyer’s book, Silk Painting for Fashion and Fine Art. Her work has also been exhibited at the United States Botanical Garden Conservatory in an exhibit cosponsored by the Botanical Garden and the Smithsonian Institution. As a feltmaker, she is thrilled with the tactile quality of the wool and other fibers, and loves that felt making is an ancient and very adaptable medium. Her work can be seen locally in the Auburn Old Town Gallery. Lori specializes in creating whimsical and colorful mosaics using glass, tile and ceramic. She is drawn to florals and color in her work and enjoys brightening up a room with the fun, yet realistic mosaics that capture the light and shine. She creates complex tribute guitars to memorialize musical artists and their songs. These guitars include tributes to the Beatles, Rolling Stones, Elton John, David Bowie & the Eagles. Pet portraits are another specialty, created to capture the feeling of those dearly loved 4-legged friends. Lori has always had dogs and can’t imagine life without them, so her bond with animals shows through her creations. Creating 3-D, window and wall mosaics, Lori’s work can be seen in several galleries and has shipped world-wide. She happily accepts commissions (including the tribute guitars) and teaches classes. Doug Horton’s jewelry is a study of detailed patterns that satisfies his need to be meticulous. He looks for materials that challenge: mother of pearl, jade, gold, coconut, silver and coral. Each has its secrets that must be searched out. Ann is an award-winning Master member (MSA) of the International Society of Scratchboard Artists (ISSA), and an associate member of the Society of Animal Artists. Her specialties are pet/animal and nature subjects, although she’s been known to tackle a tractor or motorcycle drawing. Ann gives demos and teaches workshops at various venues, including her home studio. She was one of the workshop presenters at the 2012 – 2014 & 2018 ISSA annual meetings. She was a featured artist at the 2015 & 2016 California State Fairs, demonstrating scratchboard in the Fine Art Exhibit Hall. Her drawings have been published in North Light Books’ Strokes of Genius 7, Strokes of Genius 10 and Art Journey Animals. In 2015, her scratchboard drawing of a Boston terrier was licensed to Suzuki Motors as a decal option for Alto cars in Japan. You may also see her work at the Auburn Old Town Gallery. Paula Amerine, illustrator of The Art of Real Food Cookbook, worked with local farmers to produce illustrations of seasonal fruits and vegetables for this lush cookbook. The paintings are visually instructive in nature, and inspire the community to see the beauty in what we eat and recognize how fortunate Placer County residents are to have such abundant options for our meals. She is a retired Del Oro High School art teacher who now paints full time. Paula volunteers for community art projects, most recently the painting of a utility box in Auburn. Poster design for the 2017 Auburn Rotary and Placer Office of Education’s One Book One Community is her most current contribution integrating her passion for knowledge and art. Janet creates unique jewelry from beads and specialty pieces that she finds on her travels. She incorporates the new with the old; giving each its own individual story. Eight years ago Janet joined the Foothill Quilters Guild where she offers embellishments, beads, specialty pieces and fibers to art quilters and to those who make wearable art. With her love for art quilts she decided to start making her own art wall hangings. Ten years of living in the foothills has given Janet a chance to participate in local art shows. Lisa has been playing in clay for over 20 years. Her love of horses and nature influences her designs. Over the years she has become proficient in the Raku firing process. It’s an extreme type of firing that provides unpredictable results which can result in flashes of metallic color and smoke crackling. Lisa is grateful to take custom orders using horse hair from people’s own horses, giving them them something to cherish for a lifetime. Art has always influenced Jenn’s life. With a degree in Interior Design and a minor in Fine Arts, she used her background in ceramics and sculpture to meld the two mediums with gourds. Jenn is grateful for the left brained, intellectually stimulating world in which she spends some of her time as an architectural designer…but grateful for the enlightenment and creativity that allows her right brain to rise. Brenda is a self taught artist, dipping into watercolor, pastel, colored pencil and fiber art. Her award-winning paintings are in corporate and private collections. She proudly displays her work in the Crocker Art Gallery gift shop, Wholesale Art and Framing in Rocklin, The Flower Farm in Loomis, and Home to Roost in Fair Oaks. John specializes in custom jewelry for women and men. He uses semi-precious gemstones that are handcrafted into polished cabochons set in sterling silver. His collections show a variety of styles and his goal is to create one of a kind, timeless jewelry for all ages of both genders. He wants his customers to understand they have chosen a piece of art that was meant to be worn especially by them. Big western landscapes, whimsical creatures and the endless palette of summer flower are the inspirations for my silk paintings. Working with dyes on silk has given me the perfect way to illustrate the world as I see it. Joy and serendipity are huge forces. Absolute control is abandoned and desires are negotiated with resists and surface treatments. The end painting is forever unpredictable…often better than planned…and the process is an exciting, exasperating, joyous journey. A graduate of the Art Studio program at U.C. Davis, Sean works in multiple media and multiple subjects. Some of his favorite mediums are Intaglio, graphite, Photoshop, and other digital media. He is an experienced printmaker who also enjoys working with graphite pencils. Sean spent extensive time developing multiple printing techniques while working in the U.C. Davis print lab. Sean is represented by Art Obsessions Gallery in Truckee, California.